Mirai Face + Mirai Cleanser is one of the best, yet advertised on television for facial care. It’s been on ABC, Hallmark and FOX television. Mirai Face + Mirai Cleanser is a deep cleaning kit that will clean deep down in the pores. It unclogs the pores while it massages the skin with the cleanser. The cute little pink hand held cleaner (not cleanser) has two sides that have different textures for cleaning deep into the pores. Rechargeable features. Just charge and go! After the use of this, even once, you’ll notice a change in your skin. Your skin will become softer, shinier and even younger looking. The results that you will see after a few uses are almost unbelievable. Bit O’ Everything has been sponsored by The True Company for this giveaway. 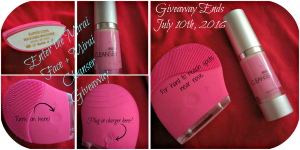 One of our readers will have a chance to win their very own Mirai Face + Mirai Cleanser set. You must not have won any of the True Company products in the past year. You must be in the USA, 18+ in years. All of the information and thoughts are that of Bit O’ Everything, none else. While I did not obtain compensation for this post, I did receive one of these for my own use during the testing to share my own thoughts. The post and review are done within the FTC guidelines. I’m wanting to improve my skin appearance, because my face and skin is very sensitive and it is dry.